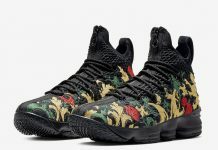 LeBron James and Nike Basketball are showing love to the city of Cleveland with their latest colorway of the LeBron 15 Low. Look for the Nike LeBron 15 Low “Team Red” to release on June 1st at select Nike Basketball retailers and Nike.com. The retail price tag is set at $150 USD.